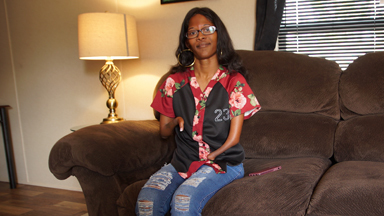 After crushing her hand in a car door, Kayla Hansen from Arizona, was worried she might have to take some days off from her job as a restaurant manager - but it changed her life forever. The seemingly small accident triggered chronic regional pain syndrome, or CRPS, a condition described as more painful than childbirth and limb amputation - and with no known cure. The 29-year-old told Barcroft TV: “CRPS is a condition where your nervous system attacks your entire body. In some people it will contain itself on one arm or one foot or one leg. In my case, I have a full body form. “It is rated the highest pain disease in the world. CRPS outranks any amputations. It outranks natural childbirth, any broken bones, more painful than cancer. “CRPS is nicknamed as ‘suicide disease' because such a high number of people commit suicide that have been diagnosed. “I feel from head to toe like someone has dumped gasoline on me and set me on fire and put me in the trash compactor." It’s rare for sufferers of CRPS to display outward physical signs but in Kayla’s case, she doesn’t just feel the sensation of burning, her skin blisters and burns. Her symptoms are so severe that many doctors have said Kayla’s is the worst case of CRPS they have ever seen. She said: “On a scale of one to 10, my CRPS pain most days is a 10 and that’s with my medicine. I might get lucky some days and it goes down to a nine or a nine and a half. But it never goes below that." There are four stages of the syndrome and Kayla has stage four, “the absolute worse your CRPS can get”. In just two years, Kayla went from having CRPS in her right arm and hand to her entire body – even her scalp. She uses a cream, designed for people who are undergoing radiotherapy, on her skin. “It’s just gotten worse over the two years because my CRPS has spread so fast. Back when I just had it in my right hand and right arm, I was able to function some. But now I can’t drive. I can’t really do anything by myself. I can’t even wash my own hands. So, it’s really debilitated me,” she explained. CRPS can lay dormant for years then be triggered by a seemingly small injury. Kayla said: “It was December 27 2015 when I actually got my hands slammed in between two doors at work and I just thought that maybe I had broken or sprained it. A year after the incident, Kayla had burns on her arms and went to the hospital to seek help. Doctors initially didn’t believe the burning was happening from within but when nurses saw first-hand the lesions developing and cracking in front of them they accepted it was part of Kayla’s condition. 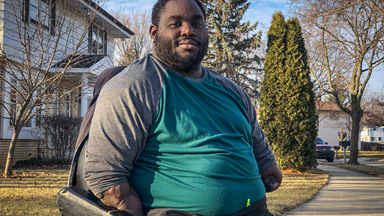 “When I got diagnosed, my doctor had sat my mom and myself down and said he was very sorry but with all the signs and symptoms that I was portraying he was almost positive that I had a disease called CRPS. Kayla went from being an independent, sociable young woman to someone who was bed-bound for days at a time. She said: “I went from managing a fine dining Italian restaurant and working anywhere form 60- 80 hours a week to now, literally, I can barely get out of bed. When I am at home, I will stay in bed for three-four days at a time just because every joint in my body hurt, every muscle, every bone, every nerve ending, everything hurt all at once. There are three main triggers that cause Kayla’s CRPS to flare up: stress, water and heat. Kayla said: “Whether it’s seeing the new doctor, whatever the case maybe. If I get stressed, I get really bad flare-ups on my arm and then I also get burns all around my face and down to my chin area. “Every time I take a bath, even if I have help, getting my hair washed and different things, I still will break out with numerous burns. But in an extra cruel twist, because Kayla was working in Arizona when her CPRS was first triggered, the only way she can still pay her medical bills is to remain in the state – even though its average temperature of 86 degrees Fahrenheit is the worst possible conditions for Kayla’s condition. During the summer months where the temperature can tip over the 100 degree mark Kayla has to stay in her bedroom, which is carefully monitored to 65 degrees Fahrenheit. Although there is no cure for CRPS it can go into remission. Kayla has tried countless treatments to try and manage the levels of pain she endures. She said: “I have gone under quite a few treatments since getting CRPS, I have done 10-15 different nerve blocks, which is where they put me under anaesthesia; I went for ketamine infusions - in cases with people that have severe chronic pain - it can be used to basically restart their brain and none of those were successful either so then I moved into spinal cord stimulators. Raising awareness of her illness has helped keep Kayla positive and able to imagine a future where she can regain some independence. She said: “I have been described as a CRPS warrior or as a pain warrior who continues to fight on a day to day basis; refuses to give up, does all the research on their own finds their own doctors and treatments and helps other people. “If I even help one person or help one family member, or doctor, then it makes my disease easier to handle.